NEARLY 2 BILLION PAGE VIEWS! Hauntworld.com is the World's Biggest Haunted Attraction web site. There are several ways to market your haunted house supply company, retail store, haunted attraction, horror movies with Hauntworld.com. Please click on the information that best suits your needs.Hauntworld Can help your business FIND new customers and send target traffic to your website. 2019 is going to be a HUGE year helping haunted houses find new customers. Hauntworld.com is the World’s #1 haunted house and Halloween Attraction website helping millions of people find Halloween attractions including haunted houses, hayrides, corn mazes, pumpkin patches, escape rooms & more. Create a FREE account & Haunt Listing on our website today, or login to your existing Haunt Listing to make 2019 updates. Log onto Hauntworld.com and update or create a FREE attraction listing today, including escape rooms! The ALL-NEW Hauntworld offers the latest haunted, escape and horror news on a weekly basis, plus new directories to help people find everything from haunted attractions to escape rooms. The new Hauntworld.com also features Google map technology which helps with local and regional searches. Hauntworld now offers profile listings rather than banners. Banners are now merged into your state page listing. The new look streamlines Hauntworld.com and helps consumers to search and find attractions. Hauntworld.com offers premium page 1 listings and free page 2 listings. Leaderboard banners can still be purchased which are located at the top of each state page. • Ratings: Now each profile will show consumers your ratings and reviews from Google, Facebook, Yelp, Trip Advisor and Hauntworld. Consumers now can easily leave a review of your haunt on Hauntworld. • Massive overhaul of the entire site to comply with new google standards, along with a very expensive ongoing SEO campaign to ranking Hauntworld in the top 10 of each major search category. 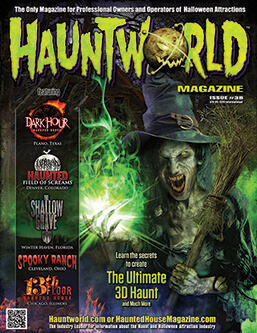 • Hauntworld Magazine featured articles will now only be found within Hauntworld.com including the subscription options. • Hauntworld has the largest haunt following on social media with 600,000 Facebook fans. Hauntworld will use this group to promote every single featured haunted house in 2019. • Learn how to get your featured listings FREE by signing up with Fearticket.com the best haunted house ticketing system now with box office solutions. Do you own or operate an Escape Game? Hauntworld.com now offers free listings for Escape Games, helping our online guests find your attractions year around. By this summer, Hauntworld will feature more than 1,000 escape room listings. Hauntworld.com attracts over 3,000,000 guests in off season months helping people find attractions, so it's important to list your Escape Room TODAY! LOG IN TODAY AND ADD YOUR ESCAPE GAME! Here is what your peers are saying about our banner program. "Hauntworld.com was the number one source for referral traffic during Sept. and Oct. 2013, sending 80.69% of the traffic to our website. Advertising on Hauntworld is a no brainer, no other website comes close to the amount of traffic they send. "One of the best ways to send Traffic to Your website (and ultimately more people to your attraction) is, without a doubt, Hauntworld.com. Hauntworld sends us more traffic than any other haunt-related site and their banner program is one of our essential online advertising tools. Highly recommended!" "We have advertised on Hauntworld heavily every year since it began…A great way to target haunted house goers in your market and a vital part of your attractions advertising budget!" "Hauntworld.com is a driving force in our marketing campaign for Headless Horseman Hayrides and Haunted Houses for advertising exposure and ticket sales." "Hauntworld.com advertisements have been a staple in our campaigns for years, yielding thousands of hits to our website and increasing attendance every season!" "Hauntworld.com was huge for Bennett's Curse this year. Hauntworld.com was our #1 referral website and it made a huge impact for our online marketing strategy this year. Hauntworld.com was worth every penny." "Hauntworld.com sent our website over 28,000 visitors!" Join us on YouTube, where we share haunted house videos every month and of course on Twitter too. IF YOU WANT THE BEST POSITIONS CALL OR EMAIL TODAY! Hauntworld.com allows users to create your own website within the website including unique URLs. When updating your Haunted House Listing, you can embed your Facebook, Twitter, SnapChat, and YouTube pages, so whenever you update your social media it automatically appears on your Hauntworld profile. 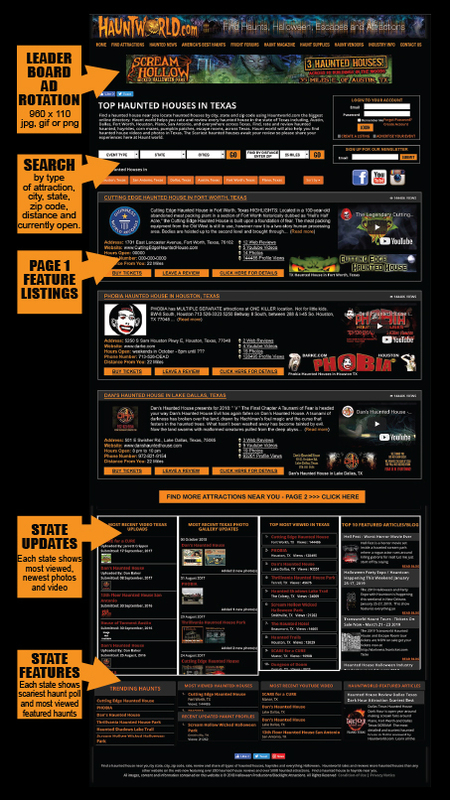 On your Hauntworld.com haunted house profile, you can upload your latest graphics, logos & photos, plus create blogs about your attraction, update an interactive calendar, activate Google maps, and hotlink your online ticketing link so that shoppers can quickly move from a shopper to a BUYER of your haunted house tickets. Hauntworld.com profiles are FREE; However FREE profiles only appear through certain search engine searches. Second page listings are FREE! 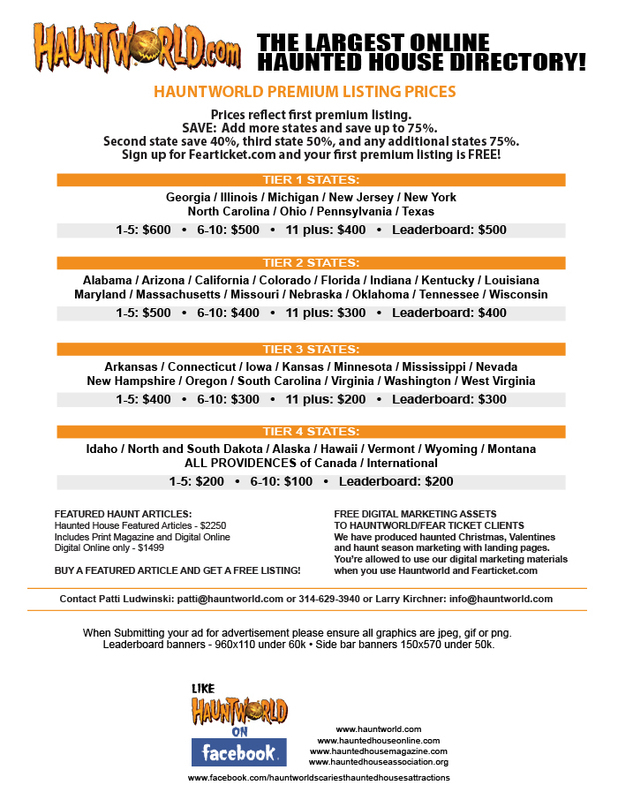 Page one premium positions start as low as $100 based on your state. get directions, videos, photos, social media, buy ticket, read descriptions and much more. THE LARGEST ONLINE HAUNTED HOUSE DIRECTORY! When Submitting your ad for advertisement please ensure all graphics are jpeg, gif or png. Leaderboard banners - 960x110 under 60k • Side bar banners 150x570 under 50k. Build Your Brand with FEATURED ARTICLES Haunts and Escapes! single media outlet that creates a top ten scariest haunt list uses Hauntworld as their major source of information. With so many haunted house listings on Hauntworld.com, Featured Articles stand out above all other information. Start to build your national brand with a Hauntworld Featured Haunt Article and get your haunted house placed in the spotlight TODAY. Featured articles are placed inside our America’s Best Haunts Section, inside your profile, on front page Hauntworld blog, and on your state and city page. Additionally, we can give you a copies of the article which you can share on your website, Facebook and your local media. Use Hauntworld to add a lot of credibility to your attraction. • Cost: $2250 - Includes Digital Online and Print Magazine. Each Featured Article includes photos and logos, along with written article, and can also include video. Hauntworld will promote your article throughout our entire system including our Facebook page which has over 600,000 likes. 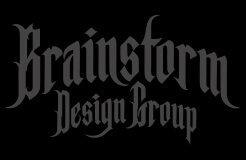 *Price includes article layout by Brainstorm Design Group. Hauntworld.com is the World's #1 Haunted House website. There are several ways to market your haunted house house supply company, retail store, haunted attraction, horror movies with Hauntworld.com. Please click on the information that best suits your needs. In 2018 Hauntworld was the WORLDS #1 Haunted House and Halloween Attraction website combined with its sister sites we attacted over 50 MILLION visitors looking for haunted attractions. Hauntworld Can help your business FIND new customers and send target traffic to your website. Please click on our media kits to reserve your space TODAY! Advertise your Haunted House, Escape Room, or other Event/Attractions. Purchase Hauntworld Banners and Featured Listings. Do you have a company with products/services you want to market to the Haunt & Attractions Industry? CLICK HERE To read details on advertising inside Hauntworld Magazine, Hauntworld.com, and HauntedHouseMagazine.com.